December has proven to be the busiest months and with New Year just around the corner, we at YuppTV endeavor to keep our viewers glued with some of the latest bouquets available for the festive season. For a long time, the Indian Expats have been asking how they would be able to watch live Indian TV channels but thanks to YuppTV, they together with their families will be able to watch some of the most amazing programs offered by one of the best Indian TV channels. This Holiday Season, save up to 50% and enjoy some of the most amazing bouquets that have been lined up for you. The packages are really cheap and easy to afford.With Yupp Hindi Gold, one gets to pay an amount of $9.99 monthly or $59.99 half yearly and $119.9 yearly which is a very special New year offer. One can also subscribe to the Yupp Hindi Gujarati Gold package which consists of paying $19.99 monthly, $99.99 half yearly and also pay $149.99 yearly as an offer for the holiday season. The last package to choose from this winter season is the Yupp Hindi Platinum which also has very good and attractive rates that any subscriber can choose from. It consists of the following charges: $24.99 which is a monthly subscription to enjoy the live Indian channels, $139.99 half yearly and can also enjoy the amazing New Year offer that you pay only $239.99 yearly and watch some of the best programs. With this kind of amazing options Indian Expats can be able to access some of the great live channels from India and also get up to date with what is happening in India. 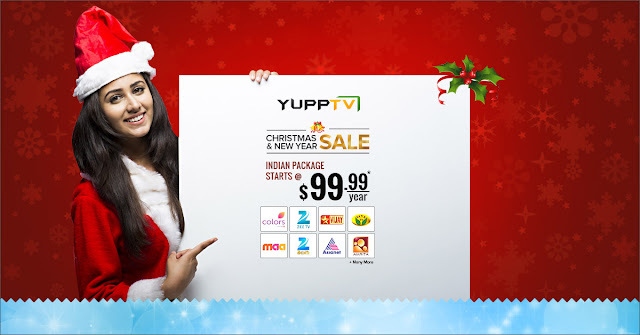 YuppTV is the premier TV that will make you enjoy your holiday season fully.